We're fascinated with how museums around the world use 3D printing to enrich exhibit experience. We're awestruck at projects like Smithsonian's X 3D platform and American Fossils' Virtual Lab. We love this stuff, and we were thrilled when an opportunity came to design a 3D printing exhibit for the Royal Ontario Museum. The result was our D-I-Y 3D Printed Mesopotamian City exhibit, where ROM guests used 16 iPads and our 8 3D printers to design ancient city blocks, print them out, and add them to a massive collaborative 3D city. At the end of the exhibit, we had generated a spectacular menagerie-cityscape with hundreds of unique elements — each piece designed by a different person. Here's how we did it. The plan was to use Autodesk's 123D Design for iPad to design a virtual 3D city block (4x4x4cm) using a combination of pre-designed Mesopotamian architectural elements. 123D Design is a gorgeous free app, designed to be easy to use for basic 3D modelling. After twenty minutes of design time, we would print participants' city blocks in front of their eyes, and place them on our specially designed light table for display. We worked with students from the [R]ed[U]x Lab (Ryerson University Architectural Science Design Lab) who designed twenty discrete Mesopotamian-inspired architectural elements in Rhino (a more robust, commercial grade 3D modelling program), before exporting them to 123D Design. The key was to design elements that were beautiful and recognizable as Mesopotamian, yet would support our target print time of 15 minutes per city block. This meant designing details that would withstand low resolution printing (0.4mm), a fast nozzle speed, and require no support material. We took a few liberties with Mesopotamian architecture, but we don't think our ancient architectural predecessors will mind. Our 16 iPad design area was facilitated by our team at a 1:4 ratio, to ensure the learning curve for participants was smooth. Guests had a great time, and the quality of the design and prints was incredibly impressive. We were shocked at how adept the general — and inebriated — public was with 3D modelling (the exhibition took place during the ROM's Friday Night Live event series), and with the quality, creativity and diversity of models produced in the short 20 minutes we allowed for design. After the exhibition, we uploaded all models to our Shapeways store so participants could view or download their city block. They can also order their own model there in a variety of materials. 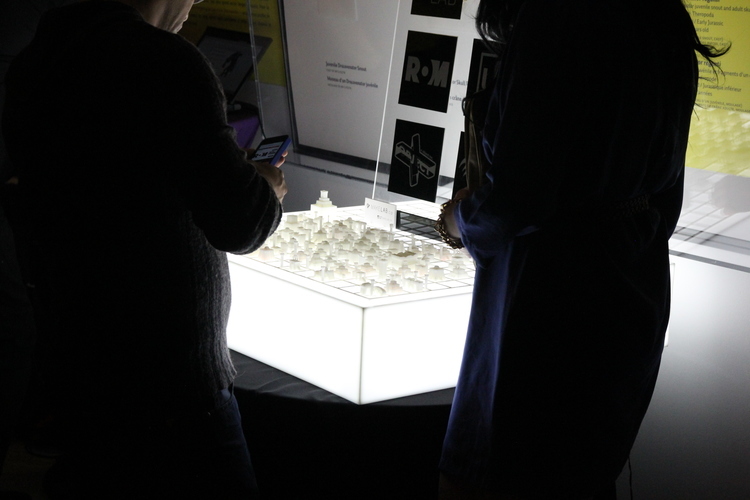 The project was a great success, one we owe to our great partners at Ryerson's [R]ed[U}x Lab, who also designed our gorgeous light-table city foundation, file workflows, and helped facilitate; the University of Toronto’s Critical Making Lab who kept our 3D printing fleet operational during intense use; and of course the ROM.